Turn time is the bench mark by which ocean terminals measure efficiency. The longer it takes to move a container on or off the ship or through the facility, the costlier that unit becomes in terms of handling and vessel delay. Container ships aren’t getting smaller; in today’s fast paced world it’s becoming impossible for ports to compete without technology. Automation is not the way of the future; it’s quickly become the norm today. For years, terminals in Europe and Asia have been vastly superior at container handling. In the States the average ocean terminal performed between 28 and 34 ship to shore lifts per crane per hour. In the yard, conventional rubber tire gantry cranes or yard hustlers move containers into stacks. Both require extensive manpower. In the Netherlands terminal operators were reporting around 41 moves per hour comparatively. As early as 2015 the port of Tenjin Palapas was lifting 81 containers per crane per hour while Shanghai moved 167 containers per lift per hour using tandem hoist cranes under the control of one operator. Initially the answer could be found in the number of cranes working the ship. Back in 2015 a U.S. terminal would put 3 to 4 cranes against a 12,000 TEU vessel. In Asia where labor was cheaper the port would throw 5 or 6 cranes against the same size ship. As ships got bigger, ports in Europe and Asia realize they had to work smarter moving to dual hoist and quad hoist cranes. In addition, the way containers moved within the terminal had to radically change. America was vastly unprepared for the megaship boom sailing over its horizon. 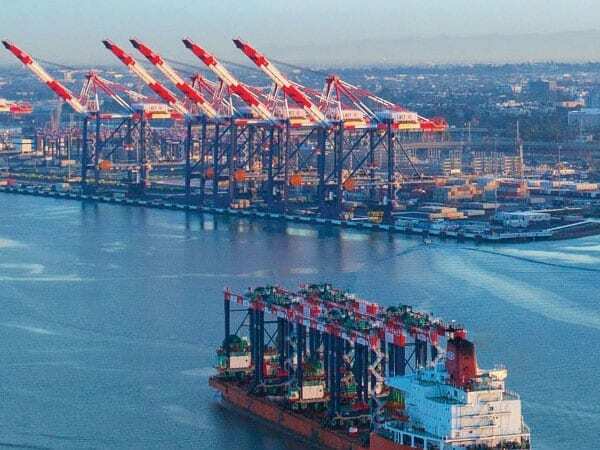 As mega ships began calling Southern California it became apparent that to effectively move containers, the combination of shore cranes and yard equipment needed to work more efficiently. TraPac Los Angeles was the first container terminal to semi automate their operation. In 2015 TraPac embarked on a project to electrify and automate a portion of its container and rail yards. Utilizing Kalmar technology, a traditional ship to shore crane would drop a single box on the quay to be picked up by automated straddle carriers. Guided by magnets mounted in the tarmac these autostrads moved the boxes to remotely operated stacking cranes or the automated rail positioning crane. Guidance is assisted by advanced laser and GPS technology all controlled from a central operations hub. The days of labor-intensive operations are being replaced by the same workforce handling multiple containers in a shorter period of time. Shift changes are accomplished by one operator standing up and another one sitting down at the same console. Kalmar’s One Terminal concept is the integration of automated yard equipment with NAVIS operating systems. NAVIS, a leader in integrated software, has produced a terminal operating system (TOS) N4 which integrates control of physical handling equipment with container positioning and real time yard activity data. Competitive with TOS providers such as Advantech GMBH Germany and Cirrus Logistics of the U.K., NAVIS headquartered in Oakland has 30 years of experience working with terminal operators to “optimize every facet of facility operations.” TraPac added automation to an existing well-established well-run facility. Across the harbor a massive reconstruction project began in Long Beach. In order to create perhaps the most sophisticated facility in the United States, LBCT executives traveled around the world to review automation in action. “What we have achieved here is a major paradigm shift in our industry, certainly here in Southern California or for within the United States” Otto said. Driven by technology provided by ABB Ports Zurich, LBCT has fully integrated multi-functional ship to shore cranes with remote controlled yard equipment to create a fully automated container terminal. Combining dual hoist container cranes with remotely driven yard vehicles and stackers the terminal is able to maintain operational consistency across multiple shifts. Labor has done an outstanding job of adapting workflow within an automated environment. LBCT was committed to providing the training necessary to bring its work force up to the higher skill sets needed to operate an automated facility and according to management they are doing very well. Uno Bryfors, senior vice president of ABB Ports noted, “Automation has been maturing and spreading to all sizes and types of terminals. We have delivered automatic stacking crane automation to 27 different terminals around the world each having between 4 and 72 cranes per terminal. In terms of fully automated terminals, Mr. Byfors noted that it will still take some 5 to 10 years before we see these facilities around the world. Remote ship to shore technology has taken hold faster than automated stacking cranes. ABB operates a remote shoreside package in a dozen terminals on five continents. A notable example of full automation at work is APMT’s Maasvlatke II terminal in Rotterdam. Remote operators control all functions from vessel lifts to automated stacking at a central location. Vessel and yard operations run 24 hours a day and as with other ABB facilities shift changes are simply a matter of changing operators. There are no crew change delays. Massvlatke II has a design capacity of 2.7 million TEUs. The terminal operates 10 high speed double trolley ship to shore cranes, 72 auto-guided vehicles and 54 automated RMGs. The eight track on-dock rail terminal connects the Port of Rotterdam with the German border at Zevenaar-Emmerich. Technology will continue to dominate the construction and redevelopment of ports worldwide. Automated packages as offered by Kalmar and ABB provide “off the shelf” solutions to design and development. The ground has already been broken and it is only a matter of tweaking existing technology. Shoreside labor worldwide has also begun to understand the need for their ports to remain competitive. Concerns for a stable work environment and job security are still important but with mega ships and increased terminal capacity must come that paradigm shift in port productivity. Will labor and management continue to embrace the issue of productivity through automation and allow ocean terminals to move up and out?